Helios provides the tools that take the risk out of energy efficiency project finance. Insuring energy efficiency project performance has typically been only done with large project performance contracts, leaving the small and medium sized buildings at risk on efficiency project performance and savings. HELiOS’ patent pending risk assessment and rating solutions have been designed to provide the risk assessment needed by insurance companies to underwrite policies for PACE funding vehicles, as well as traditional lenders, financiers, and building managers. HELiOS is the world’s first to offer quantitative energy performance risk assessment and rating products. 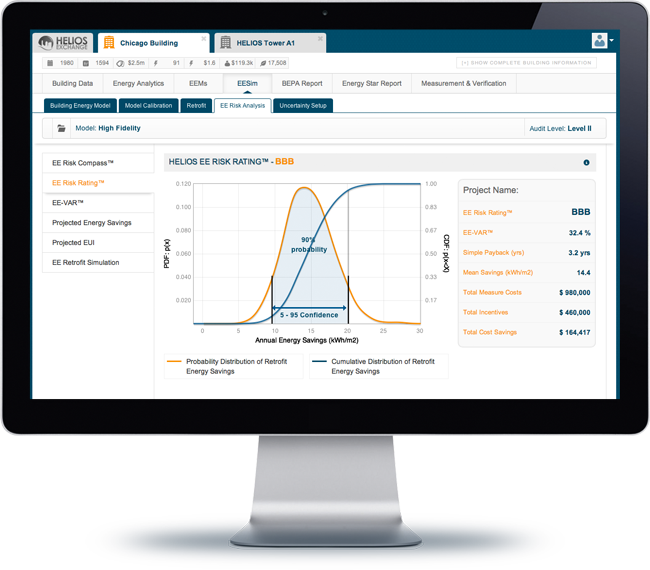 Provides a rigorous, simulation-based risks metric necessary for understanding and comparing the performance risk of energy efficiency projects. Bases equipment performance uncertainty and measure specific energy savings estimates using an energy modeling tool certified by the DOE. Uses cutting edge stochastic statistical methods to calculate the uncertainty of the savings estimate which is used for developing a overall risk rating. Delivers through partnerships with major insurance companies PACE programs, and financiers. HELiOS provides the data needed for obtaining performance insurance for your projects. Send me bi-weekly updates on energy efficiency markets, trends, useful tips and more. If you wish to receive our monthly newsletter updates please sign-up now. Helios Exchange is the world's first commercial real estate platform for energy retrofit projects development, insurance and financing.